Here in the US, except for car geeks, most people are unfamiliar with the Sunbeam name. Some people know about the Alpine and Tiger, but you have to be a true car geek to know about (or care about) these 3 Sunbeam badged cars. The first is a 1969 Sunbeam Alpine GT. In the UK this was known as a Rapier. The first thing you notice about this car is its uncanny resemblance to the Plymouth Barracuda. 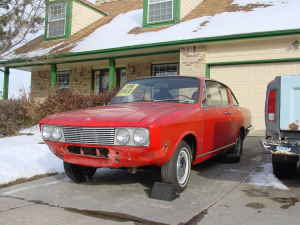 The designer of the car, Roy Axe, claims he did not copy the Barracuda and the two cars were designed independently. Chrysler owned the Rootes Group when this car was introduced, so I find that a little hard to believe, but it doesn't matter, it's still a nice looking car. The Alpine GT came with Rootes tried and true 1725cc engine. It now had a new crankshaft with five main bearings and a freer flowing exhaust, but the Alpine GT still took over 12 seconds to reach 60 MPH and its top speed was under 100 MPH. The suspension was new by Rootes standards, but pretty typical of what was found in most small cars of the day; MacPherson strut suspension up front and a live axle mounted on leaf springs in the rear. The interior is where this car shined. The dash was real wood, there was a center console and the seats were comfortable and supportive (by 1969 standards). It's a very classy interior and a nice place to be. Rust was an issue with these cars and parts, especially body panels and trim, are tough to come by. This car appears to be rough but fairly complete, except for the front bumper. Located in Littleton, CO, click here to see the Craigslist listing. The second is the oddest of the bunch, a 1967 Sunbeam Minx. The Minx was actually a pretty common car, but was, for the most part always badged as a Hillman, including here in the US. Chrysler, capitalizing on the sporty image of Sunbeam and in a last ditch effort to sell a few more of these in the US, rebadged as a Sunbeam Minx. The car being offered on eBay is said to run, but needs bodywork. The seller mentions a hole in the floor that needs patching, which would make me believe that there is plenty of hidden rust, too. There's little or no difference between the Hillman Minx and Sunbeam Minx, but if you want something that will attract attention and questions, the Sunbeam version of the Minx is the way to go. Located in Bartow, FL, click here to see the eBay listing. There is a great enthusiast website dedicated to the Minx called "What's a Hillman? The Hillman Minx Pages". You can find it here. 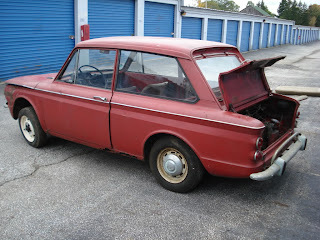 Last, but by no means least, is a 1965 Sunbeam Imp. Rootes developed the Imp to compete with the Mini. Unfortunately, it was rushed to market and many of the cars initial flaws were found by its owners. Most of the problems were subsequently fixed by Rootes, but the damage was done. Sales of the Imp never met Rootes expectations. Like the Minx above, this was a Hillman badged as a Sunbeam for the US and a few other markets. For a 1960s rear engined car, it handled well. The Coventry Climax engine was advanced for its time and although it put out only 39 HP, it moved the car along at a reasonable pace. The money that Rootes sank into the development of this car all but killed them. When sales didn't meet expectations, Rootes was forced to sell the company to Chrysler, who quickly ran it into the ground and eventually wound up selling it and Simca - another Chrysler Europe brand - to Peugeot. Like the two Sunbeams above, this Imp is in need of total restoration. The car is fairly solid, showing just some rust along the rockers. The front left fender is damaged, but the seller is including a used repair panel, which appears to be in decent, but not great, shape. Located in Streetsboro, OH, click here to see the eBay listing. For a very well written, detailed article on the development of the Imp, click here to find the Rootes-Chrysler.co.uk website. All three of these cars need serious work. When finished, none of them will be worth the time and money you put into it. These cars are labors of love. It may not be practical, but I'd love to see these cars back on the road and at car shows someday. My parents had a Sunbeam Rapier- I believe they described it as the WORST car they ever had. I think it lasted 3 months before they dumped it. They bought it to replace a Borgward Isabella (which they loved madly) and it was swiftly replaced by a Volvo 122s red 2-door, which we kept in the family for 30 years. SImple but amazing little Amazon.